It’s 23:30 BST, the PCGamesN newsroom is wrapping up our coverage of EA’s show at E3, and in my view that was exactly whelming. Everyone was here for Anthem and it delivered, and this streaming banter sounds interesting. Yet there was no sign of Dragon Age and the new Command & Conquer is a mobile game, which has killed another little piece of my soul. And yet I have – to borrow a phrase – A New Hope, thanks to Star Wars Jedi: Fallen Order. It’s a slim hope, a candle in the wind, doubtless doomed to puff out at the first sign of gameplay. 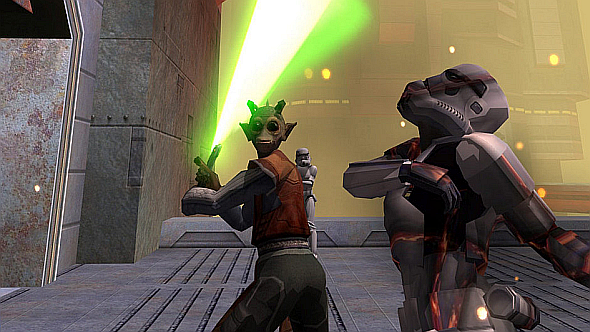 But I just can’t kill the notion that this might be a modern Jedi Knight game. And in the 15 long years since Jedi Knight: Jedi Academy came out in 2003, I’ve wanted one of those more or less constantly. There are no Jedi Knight games on our list of the best shooters on PC and therefore someone is getting a very stern letter. If you don’t know what I’m talking about, then first: my sympathies. Secondly: the Jedi Knight games remain, in my unpopular opinion, perhaps the greatest series of first-person shooters ever made. Yes, I’m serious. The series began in 1995 with Star Wars: Dark Forces, which cast the player as Imperial Officer-turned-mercenary Kyle Katarn. Before Disney rebooted Star Wars canon to give us Jyn Erso in Rogue One, Katarn was the original thief of the Death Star plans, and his game was one of the few shooters that dared break the Doom mould even when id’s breakout hit was at its peak. 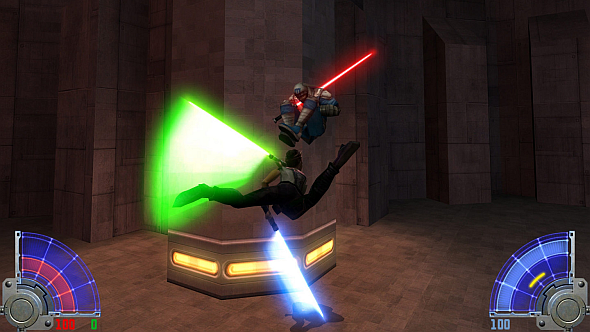 With its custom-built Jedi engine, Dark Forces gave us jumping, crouching, looking up and down, variable lighting, secondary fire modes, a proper story told with cutscenes and mission briefings, contextual mission objectives when most other shooters still had you exit levels by flicking a switch, and 3D polygonal objects in an otherwise 2D engine (often used to craft devious puzzles, over three years before Half-Life came along). 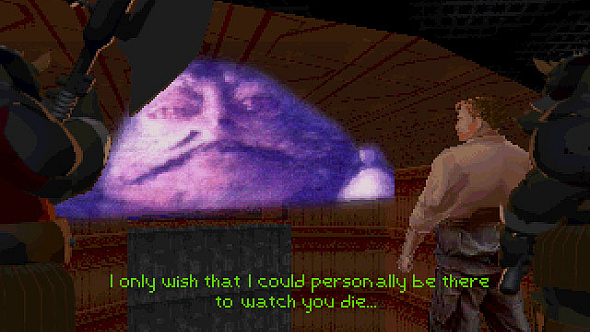 Many of these ideas were brand new to the genre, and to this day Dark Forces doesn’t get enough credit for its genius. 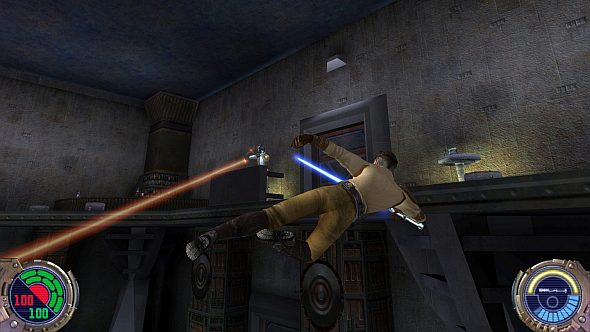 Its sequel, Dark Forces: Jedi Knight, broke yet more new ground as Katarn discovered his Force sensitivity. Releasinga year before Half-Life,it had a custom 3D engine in which you could switch freely between first- and third-person modes, upgradeable Force powers with which you could disarm enemies or attack them with thrown objects (a rudimentary form of physics damage, for God’s sake! ), and – oh yeah –a lightsaber.It was incredible. Jedi Knight II: Jedi Outcast and its prompt successor Jedi Academy were mostly refinements of Jedi Knight’s big ideas, but that’s no bad thing. 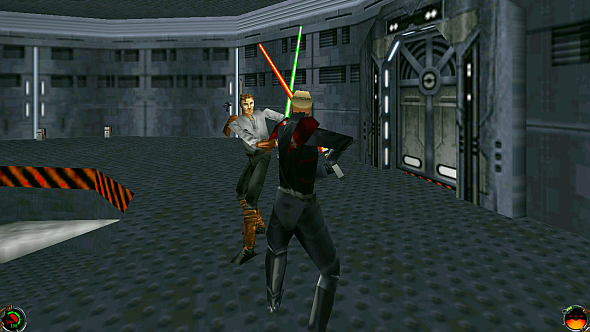 They used the famously brilliant Quake III engine and added such mouse-swinging depth to lightsaber combat that you canstillfinddueling clubs online. Force powers took full advantage of the new engine and were more sensibly implemented: rather than pre-charge a Force jump, you simply kept the key pressed to add height. Force speed slowed down time in single-player, creating an intoxicating sense of empowerment. Few other games before or since have ever let you move like this – there was even wallrunning. At the time I played a lot of Counter-Strike, Quake III: Arena, Unreal Tournament, and a host of Half-Life mods, but JK2 and JKA are still the best times I’ve ever had in a multiplayer shooter. Well and good, you might say, but surely JK2 and JKA have been surpassed by now? Well, I challenge you to find an action game that does mouse-based melee swordplay better –maybeChivalry – but in all other respects, yes. It’s a sign of JKA’s quality that there are still people online, but it’s a niche crowd, and full of hackers.Single-player in particular has aged awfully; there’s no real reason to play it over the new Doom or Wolfenstein games, though isn’t it interesting how – with one notable exception – the leading modern shooters are reboots of ’90s franchises? This, of course, is all as it should be. We’d be in bad shape if we couldn’t do better than a game from 15 years ago. And yet I make this claim: in all that time, no game has achieved what JK2 or JKA did when takenas a whole.No shooter has blended great gunplay, great swordplay, and the thrilling combat and movement options offered by those games’ force powers. It’s a pretty niche mix, I’ll admit, but therein lies my complaint: why should that be? We’ve had no lack of Star Wars games, nor indeed Star Wars imitators: look at Destiny. It has guns, swords, and space magic. Why,in 15 long years, has no-one stepped up? Perhaps,finally,someone has. Here’s what we know about Star Wars Jedi: Fallen Order so far: it’s a Star Wars game in which you are confirmed to wield a lightsaber and to be a Jedi, meaning you definitely have force powers. And – here comes that exception I just mentioned – it’s made by Respawn, which gave us the brilliant Titanfall games. Often imitated but never equaled, their movement is the best in shooters today; theyreallyunderstand how exciting wallrunning and double jumps can be when you design properly around them, and undoubtedly surpass the physical thrills of JK2 and JKA. As far as I’m concerned, that’s two of the crucial ingredients in Jedi Knight’s mix right there. All that’s missing is guns – and, well. Come on. Blasters areeverywherein the Star Wars universe, and Respawn is a shooter studio. That’s it; I’m calling it. From now on I no longer see Star Wars Jedi: Fallen Order (it’s a daft title anyway). I see Jedi Knight III.